It’s Thursday and I haven’t printed my pre-sale ticket yet; I have to hurry because tomorrow will be THE day and I don’t want to stay outside the venue after all this route and, most of all, wait. 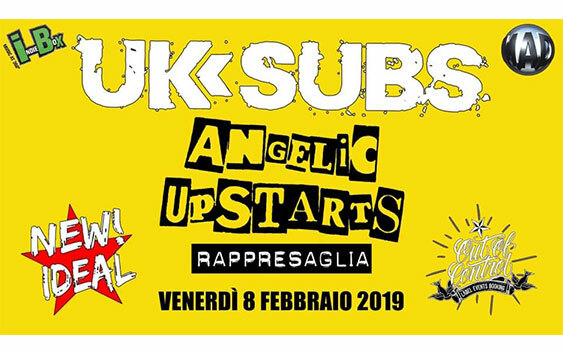 The event is still not sold-out, but I expect a great attendance to it: after all, we’re talking about three bands that shaped history, that are UK Subs and Angelic Upstarts together with our fellow countrymen Rappresaglia. If you don’t come, you’re really mad. Here comes Friday night: I plucked up courage and drove out of town alone for the first time, (moreover, in the dark), direction Lodi lowlands: I was reaching my best friend as well as my gig mate Vera. We were ready and very excited, we still didn’t believe that these bands would have played a few feet from us. Let’s gooooooo! While we predicted the songs that may have been played that night (and gossiped too, obviously), we arrived at the location: there were lots of people waiting outside, and the first thing I thought was “Oh no, I have to pee..”. I hoped they opened the gates on time, but in the meantime we were looking for a parking lot, the queue vanished (thank God!). We came in, and even before we got some beer, we handed over some notes to the Angelic Upstarts’ stand (it cost us a kidney), but all in all we were satisfied (who was there, may know). While we became poor, Rappresaglia went onstage: the venue was crowded, both in the parterre and on the terrace/stairway. I couldn’t make my way through the crowd, so I enjoyed the gig distantly. The audience was engaged, also because this has been an important band during the adolescence of the majority of participants. In the set list, weren’t missed the songs “Rappresaglia”, “Undertown” and “You & Me”, singed lightheartedly by the audience. The band didn’t disappoint: clear, precise and charged sounds performed greatly, nice band to see live. Very good! After chatting with our crazy friends Fabio and Michele, and with Christian at its Anfibio Records’ stand, we took place in the first row to enjoy more the Upstarts. The performance begins with “2 Million Voices”, and while I sang it aloud, I tried to figure out who Mensi looked like.. I’ve got it! He resembled Alan of “The Hangover 2”, he was also wearing a yellow t-shirt, so to me he was just like him! (Sorry for this break, but I wasn’t used to see him with this look). The guys are in of shape: “Never Had Nothin’”, “Teenage Warning”, “Never Again”, “Mr. Politician”, “Student Power”, “Give The Fox A Gun”, “You’re Nicked”, “Solidarity”, “Woman In Disguise”, “Kids On the Street”, “Last Night Another Soldier”, “Safe Heaven”, “Anti Nazi”, “Machine Gun Kelly”, “Shotgun Solution”, “I’m An Upstart”, “Police Oppression”, “The Murder Of Liddle Towers”, this set list is not bad at all, and finally they played “Tories, Tories, Tories” and “Leave Me Alone”, songs that I’ve been waiting to hear live for a long time. What a satisfaction!!! You’re great, Upstarts, I always like you a lot, always a guarantee!! Once their live set ended (and my Perlenbacher Strong beer too), we were so “charged” and euphoric, because we knew that the band fronted by the old Charlie would have left a toothy smile on our faces too. Just the time to converse with my friend Silvia, that the Subs started their set, beginning with “C.I.D.”; Vera was right: they would have played “Another Kind Of Blues” in its entire to commemorate the 40th anniversary of its release, that’s cool! “I Couldn’t Be You”, “I Live In A Car”, “Tomorrow’s Girl”, “Killer”, “World War”, “Rockers”, “I.O.D.”, “TV Blues”, and so on, one song after the other, without pause and digression. The years go by and they get older, but they still look like young lads, they have fun with the audience, interact, laugh and drink Moretti beer (Wow!). After having played this album, the continued with the sure “Warhead”, “Riot”, “Emotional Blackmail”, “Limo Life”, “Party In Paris”, “Teenage” and “Fragile”. A wonderful live set, finally I took my revenge and managed to relish their gig as it ought to be! It finished also their performance and, after an encore, Vera, Martino and I were waiting the right moment to meet up the old Charlie, since I’ve always wanted to meet him. This is it, near his stand, all quiet with a beer in his hand, it’s our opportunity. We acted like cool kids and asked him to take a photo, but since he realized that we are beautiful people, he stayed to chatting with us for about 10 minutes, telling us stories about their Italian tours and other anecdotes, between a toast and another. It was a honor to me/us to experience this moment, to the point that I realized all of this when I bid him. New Negazione album devoted to Marco Mathieu!